Are Nuclear Reactions Still Occurring at Fukushima? You know that Fukushima reactors 1, 2 and 3 all melted down within hours of the Japanese earthquake. You also know that at least some of the subsequent explosions could have been caused by small-scale nuclear reactions called “prompt moderated criticalities”. But you might not know that nuclear reactions may still be ongoing. We calculate the relative abundance of the radioactive isotopes Iodine-131 and Cesium-137 produced by nuclear fission in reactors and compare it with data taken at the troubled Fukushima Dai-ichi nuclear power plant. The ratio of radioactivities of these two isotopes can be used to obtain information about when the nuclear reactions terminated. The data from the drain near reactor 2 and from the cooling pond at reactor 4, where spent fuel rods are stored, indicate that the reactions must have been burning much later. These chain reactions must have occurred a significant time after the accident. “It would be diﬃcult to understand the observed anomaly near the unit-2 reactor without assuming that a signiﬁcant amount of ﬁssion products were produced at least 10 – 15 days after X-day,” says Matsui. On April 18th, nuclear expert Arnie Gundersen said that iodine 131 readings indicated ongoing nuclear reactions. Unit 3 may not have melted through and that means that some of the fuel certainly is lying on the bottom, but it may not have melted through and some of the fuel may still look like fuel, although it is certainly brittle. And it’s possible that when the fuel is in that configuration that you can get a re-criticality. It’s also possible in any of the fuel pools, one, two, three, and four pools, that you could get a criticality, as well. So there’s been frequent enough high iodine indications to lead me to believe that either one of the four fuel pools or the Unit 3 reactor is in fact, every once in a while starting itself up and then it gets to a point where it gets so hot that it shuts itself down and it kind of cycles. 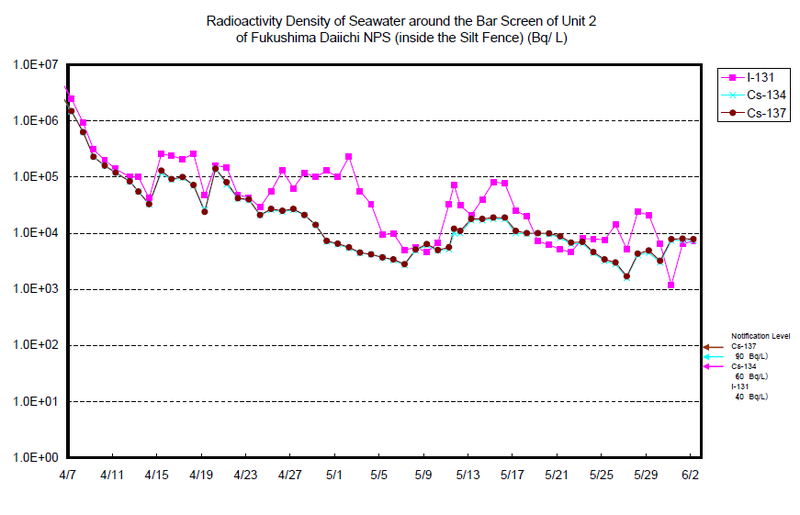 Radiation levels in water inside the silt fence near reactor 2 are high and rising, despite large amounts of dilution. Continued very high levels of Iodine 131 with a half life of 8 days are very hard to explain for a reactor that has been “shut down”. Normally Iodine levels would drop several orders of magnitude below cesium activity levels over the sixty day period shown in the graph, but instead they continue to track each other. The level of 10,000 Bq/liter I-131 is very problematic. It is much higher than would be expected for a reactor in cold shut down for 2 1/2 months.